Legendary E50 induction motor, the hearth of your turntable and used in a variaty of Thorens tables, like TD 121, TD 124, TD 134, TD 135, TD 184, and TD 224. After 50, and in some cases even more years, the motor is literally "screaming" for a rebuild, very well audible by annoying noise and inconstant speed stability. Worn out rotor-bushings, completely dried out felt washers, which are an important oil reservoir, serving the bushings over a long period of time with oil....These are common issues a motor inevitably arise after such a long time. We offer a complete rebuild service, which includes installation of a "motor rebuild kit" and a "motor-suspension conversion kit", which upgrades MkI versions to the improved MkII version. The motor-pulley wil be tested for true runnig followed by cleaning and polishing of the belt-running surfaces. After completed revision, the motor will break in for at lest 3 days before shipping. 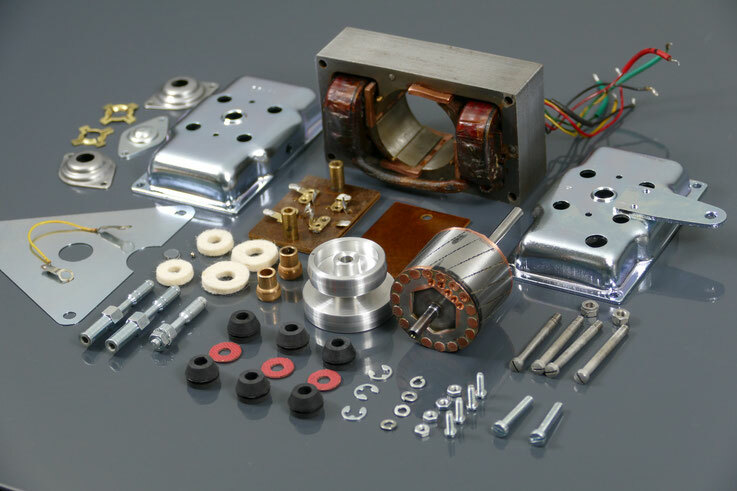 At extra cost, we also offer a plating service which includes re-plating of often oxidized upper and lower motor covers and lower bearing end-cover. The extra cost is also including soldering out of the voltage-selector board. Picture below shows a disassambled motor, ready to assamble. The above mentioned covers are already plated here.